Philadelphia is a city that loves bicycles--to commute, to exercise, to recreate, to socialize--the list is about as diverse as the population that uses them. Among the myriad bike shops in the city, Neighborhood Bike Works is a favorite of Philadelphia's youth. That's because Neighborhood Bike Works is no ordinary bike shop. Neighborhood Bike Works (NBW) is a place where youth become self-sufficient mechanics, traffic savvy riders, and young leaders. A nonprofit community organization, NBW uses bikes as the hook to engage young people in building skills and developing healthy habits that support them in and outside of their passion for all things two wheels. We do this work with young people in a multi-tiered layer of programs we call our Youth Bike Education and Empowerment Program. Youth ages 8-18 can join any one of our entry level programs (Earn A Bike, Ride Club, and more) to than have access to many graduate and advanced level programs that revolve around activities like racing, kinetic sculpture building, weekend open wrenching, and many, many more. One of these advanced tier programs is our Leadership and Advance Mechanics Course. In this class, youth ages 14-18 crystallize professional mechanic skills, practice public speaking, build networks with bicycle industry professionals, learn valuable teaching methods, and get some real life job interview experience all over the course of eight weeks. During the 2016 graduation of this course that took place in early March, youth reflected on how many job opportunities had opened to them in the bicycle world that they never would have dreamed existed. 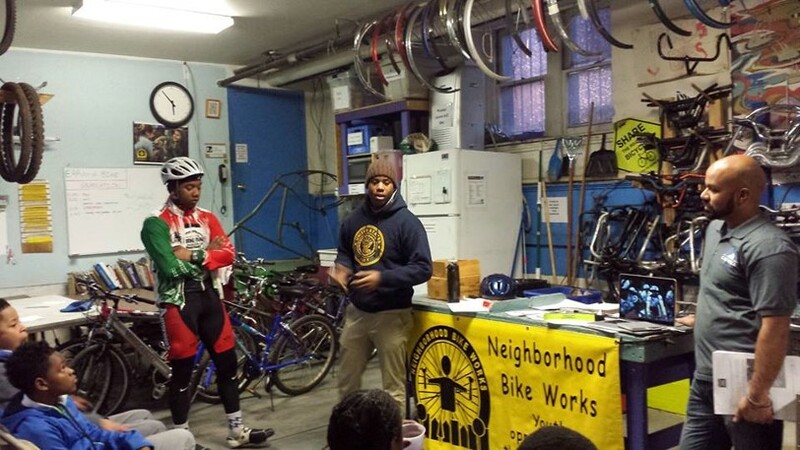 Nasir shared, "When I came to Neighborhood Bike Works I wanted to train to become a bicycle mechanic. I thought that was all you could do as a job with bikes. Now I realize there is a lot more out there—engineers, city planners, bicycle coaches—and I know the people in those fields that could help me build a career in that direction." Beyond networking and professional development, one of our keystone programs was one dreamt up and implemented by the youth of NBW themselves: the Youth Council. This core group of young leaders prides themselves as the youth voice of the organization, collaborating with the wider graduate network to ensure that NBW's values, goals, and decisions are consistently aligned with those of the NBW youth body. The inspiration for the council was gained by four NBW teens in 2014 when they attended the annual Youth Bike Summit (YBS) in NYC. Unsurprisingly, participating in the YBS has become an important annual tradition for this group. This year they are gearing up to lead a presentation at the YBS walking their audience through their process for setting up a successful youth council! As the Youth Council Advisor, I have often found myself pulling upon the insights I gained from my work with One Street in 2010 and 2011. In both years I had the privilege to attend an international advocacy conference called Velo-city. The value and pure magic of participating in those summits lends great motivation to my work with the youth council as they prepare themselves for the Youth Bike Summit year after year. Further to the benefit of supporting the Youth Council, I was able to attend the Velo-city conferences only through my efforts on two years of creative fundraising and sponsorship drives. As you might imagine, these youth now have also gained important skills as fundraisers and event coordinators in service of their own goals! In the end, NBW is not about one-way teaching of youth. Instead, we guide these incredible young people into the skills they need to become teachers and leaders no matter where they go from here. Neighborhood Bike Works aims to outgrow the all too common youth service model and step into a generation of Youth Led work. The outstanding members of our Youth Council are helping us take one more step in this direction!